Elizabeth Harrison plays works by the Dutch organ composer J. P. Sweelinck (1562-1621) and several German composers who studied with him, then spread his influence in Germany. She plays the famous 4-72 C. B. Fisk organ at Stanford University. In 1573, at the age of eleven, Jan Pieterszoon Sweelinck succeeded his father as organist of the prestigious Oude Kerk, or Old Church, in Amsterdam. In this booming sixteenth-century trade city, the young Sweelinck presided over two outstanding Renaissance organs, which he played before and after worship services and at noon on weekdays. Audience members for these performances came from all over the world bringing Sweelinck, who rarely left his home city, news and music from various traditions and keeping him abreast of new musical developments throughout Europe (particularly in Italy and England). These same travelers returned home bringing favorable reports of Sweelinck's abilities. By the last decade of the sixteenth century and the beginning of the seventeenth century, Sweelinck's reputation as a performer and composer began to attract a number of disciples from various European countries. Of particular interest is the steady flow of young German organists who flocked to Amsterdam to study with Sweelinck, later taking home with them a practicing knowledge of his music and a generous sampling of his works and pedagogical instructions. This influx of knowledge into Germany redirected a thriving organ culture with influences via Sweelinck from all over Europe. Of Sweelinck's German students, four gained particular prominence in Germany in the early seventeenth century. Jacob Praetorius and Heinrich Scheidemann returned home to prestigious positions in Hamburg at St. Peter's Church and St. Katherine's Church, respectively. Though friendly rivals, these two developed unique styles, incorporating knowledge from Sweelinck but displaying their own tastes and personalities. Samuel Scheidt returned home to Halle, where he presided over the Renaissance organ in the Market Church. Fortunate circumstances enabled him to publish his organ works and pass them on to his heirs in a much more complete condition than could any other Sweelinck student. Scheidt's three-volume Tabulatur nova (1624) includes fantasies, fugues, and variations on songs and chorales, all showing the influence of Scheidt's Dutch master teacher. Following his studies with Sweelinck, Melchior Schildt took a church position in Wolfenbüttel. Three years later he moved to Copenhagen as the court musician for Christian IV, where he remained only a few years before returning to Germany as church organist for the Market Church in Hanover. While extant music by Schildt shows his creativity as influenced by Sweelinck, little is known of his compositions because of a lack of sources and selections. Although the pieces on this recording do not represent all of Sweelinck's German students, they do explore the various styles taught by Sweelinck and further developed within the strong Lutheran traditions of north and central Germany. 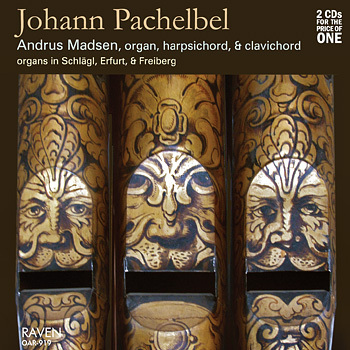 The recording begins with Sweelinck's Hexachord Fantasia, a piece that develops the hexachord (today understood as the first six notes of the major scale) using Renaissance contrapuntal techniques and increasingly faster note values. The three large sections of the piece are distinguished by a change in registration. The hexachord moves back and forth among various voices and is sometimes played on the Trumpet 8' in the pedal for bass or tenor entries. In contrast to this large work, the shorter Capriccio explores the use of chromaticism and echoes between different octaves of a single manual. The variations on Allein Gott in der Höh sei Ehr' were probably composed as examples for students to imitate. In addition to the variations on this recording, there are many additional variations by other Sweelinck students not represented here. Sweelinck's four verses each present all or part of the chorale melody using a different compositional technique. The simple setting of the opening verse states the melody in the soprano with harmony in the underlying accompaniment. Verse 2 uses imitation between two voices, played in opposing hands on two manuals. The counterpoint in verse 3 migrates among three voices, all played on the same manual. Verse 4 displays a vertical harmony with simple imitation and ornamentation moving among the voices. This verse is played on the principal chorus of the Rückpositiv. Jacob Praetorius's earnest personality created some of the most solemn writing for organ in the early seventeenth century. The short Christmas piece Christum wir sollen loben schon shows influences by Sweelinck with short motives used for imitation in the accompaniment. Although parts of the melody are heard in the manual, the entire chorale is presented in its simplest, single-note form played in the pedal as a solo. The four phrases are clearly marked by several measures of rests in the pedal before each entry, while the manuals display a clearly worked-out counterpoint in three voices. Of Sweelinck's German students, Scheidemann's organ music survives in the largest number of sources. This is due partly to chance survival of manuscripts, but also to the fact that contemporary north German organists esteemed and disseminated Scheidemann's works. Although several of his pieces appear in more than one manuscript, the Toccata in G appears in six extant sources all dating from the seventeenth century. Such an unusually large number of sources may represent the popularity of the piece in the seventeenth century. One possible reason for its wide appeal is that the piece suits many different organs, both large and small. Scheidemann's Toccata displays his well-known lively and jovial personality with nimble musical lines played in the right and left hands. The piece has four main sections. The opening section introduces the theme first in the accompaniment, then in the ornamented solo voice, and later in the bass. The second section, marked by a change in registration, uses a variation of this theme in imitation among the voices. The third section uses echoes and bass solos, again based on the same theme. The fourth section returns to a soprano solo, but combines aspects of the imitative and echo sections. Samuel Scheidt's verses on the Easter chorale Christ lag in Todesbanden (from part II of his Tabulatur nova) show the influence of Sweelinck's ornamentation, variation settings, and fantasias. In verses 1 and 2, the melody is in the soprano, played first in the manuals and then in the pedal on a 2' reed stop as a solo. Verse 3 develops the chorale in a free fantasia and uses counterpoint, ornamentation, and echo passages much as in Sweelinck's Hexachord Fantasia. Verses 4 and 5 have the melody in the tenor and bass, respectively, both played on solo registrations in the pedal, surrounded by difficult manual accompaniments. As one of his few surviving pieces, Melchior Schildt's Magnicifat I. Modi was probably part of a now lost series of Magnificat settings comparable to other cycles by Scheidt, Praetorius, and Scheidemann. Schildt's five-verse setting was originally played at the Sunday-evening vespers service in alternatum with the sung verses of the medieval Magnificat chant. Each of these five verses treats the original chant melody in a different way. Verse 1 is a strong, homophonic setting with the chant in the tenor voice, played in the pedal. Verse 2 develops various motives from the chant in a fantasia. This verse places the melody in all of the voices at one time or another, sometimes in long notes and at other times as a very ornamented melody. It also makes use of extended echo possibilities among different manuals of the organ, distinguished here with different registrations. Verse 3 is in the older ricercar style of the sixteenth century and displays an extended use of imitation and chromaticism. In verse 4 the melody is heard in the pedal underneath a quicker-moving accompaniment. Verse 5 has the melody in the soprano, while the voices underneath move in increasingly faster note values. Within these settings, Schildt's use of counterpoint, chromaticism, variations, echoes, and ornamention shows the influences of Sweelinck molded by a young organist to create his own unique but effective musical vocabulary. As one of the most outstanding pieces of the early Baroque, it appropriately ends this recording.